TOPEKA, Ks. - Kirk Kindsfater claimed his first top-five finish at the SCCA National Championship Runoffs, finishing fourth in the Formula Continental class. Kirk's ArmsUp Motorsports teammate, Jim Victor, took home an 11th place finish moving up three spots from his 14th place starting position. The race topped what was a successful week for the ArmsUp Motorsports team that saw both of their cars run strong throughout the entire National Championships at the Heartland Park Topeka circuit. Track conditions were very difficult for the race as morning rain showers and racing left the track damp and muddy for the afternoon Formula Continental race. Kindsfater began his race from the seventh spot on the grid. After a solid start the Fort Collins, Colorado native found himself fifth at the end of lap two. Shortly after the end of lap three a full course caution was shown for a two-car accident. Jim Victor's race before the full course caution was action packed. After getting stacked up in the carousel on the opening lap Victor was able to move up into the top-ten when the caution flags were shown. On the races restart Kindsfater was able to pull out a gap over the sixth place driver. Through the mid part of the race the number 32 of Kindsfater would run unchallenged. During this time both ArmsUp cars would be promoted one position as the race leader retired from the event. After the restart Victor continued to move up the order as he worked his way to the eighth position and was challenging the seventh place driver. With the laps winding down, Kindsfater was pressured for the fourth position. Kindsfater was strong leading onto the Heartland Park's two straights allowing the ArmsUp driver to maintain his fourth place position at the stripe. The result was Kindsfater's best finish in the Runoffs and hard earned after overcoming a terrible run of bad luck this season just to get invited to the National Championship. Jim Victor found himself in a tight battle for the eighth spot but a slip on the back side of the 14-turn Heartland Park course saw the Iowa resident slip down to the 11th position. Not willing to give in, Victor battled back passing back and forth for tenth place just missing a top-ten result by three-tenths of a second at the line. "This was a solid week for our team," ArmsUp Motorsports owner Gregg Borland stated at the end of the Runoffs. "Both Jim and Kirk did a great job this week. Kirk was faced with some tough odds, only getting one session of qualifying, and did a superb job. Jim improved all week long and was in contention for a top-ten finish for his efforts. I want to say thanks for Jim and Kirk for a great season; it was a lot of fun." ArmsUp Motorsports now enters the off-season to prepare for 2008. Several changes are in the works for the Sheboygan Falls, Wis. based team that will be announced in the near future. The ArmsUp Motorsports team would like the thank ArmsUp Damper Services, Cooper Consulting and K&N Filters as well as all of our mechanics and engineers for their support this season. 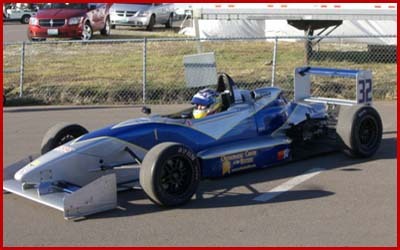 Kirk Kindsfater claimed his and ArmsUp Motorsports best Runoffs result with a fourth place finish.